Chapter Ten: Archanes to Ano Asites. With special thanks to Ston 'O protos koumparos mou', Michaelis Moloney and my friend Lala, for taking the trouble to read the final draft. Saturday the 24th of May. I awoke early this morning (if anybody - other than I - believes that 8.AM is early! ); for what was to be the first of my "Dopey" days (i.e. days off from walking); and, boy, can I do 'dopey'! Sitting up in bed, 'Rough Guide' in hand, and a dull thud in my head - the merest reminder of "one too many" the night before, which the stale aftertaste of tsikoudhia on my tongue, confirmed! - I considered my options for the following 24 hours. The archaeological museum was just around the corner from where I currently lay. The sites of Fourni and Anemospilia were within walking distance, and the "summer palace" of Archanes, was dead-bang-centre of the town that I had just woken-up in. I was spoilt for choice. After an hour or so of weighing-up my various options, of how to spend the "perfect day", I was thoroughly worn-out, and proceeded to go back to sleep! I awoke again at mid-day, to an unfamiliar noise. Launching myself off my pit, to the window, I discovered it was raining. Well, things could be worse! I looked on the bright side of these dark clouds, and came to the conclusion that if it were raining, I'd prefer not to be walking in it, which was a stroke of luck, seeing as this was the first time, in the best part of two weeks, that I didn't have to!. A "perfect day" for a visit the museum; a cursory passing of which, yesterday, had yielded the information that it closed at 3PM, so I had plenty of time to do what I do best. Precisely nothing! Well, that's not quite true. I needed to "powder my nose", and having done that, discovered that my laundry lay in exactly the same place, and in the same state, as that in which I had left it yesterday. There was no drying cycle on the machine and no sign of a tumble dryer either. With the weather as inclement as it had been, I was worried that the washing may take longer to dry than the 20 -or so - hours I still had in this town. Should I do it myself? I would have preferred to, but decided against insulting my hostess, and instead headed for the centre of town, for a coffee. I had slept too much. You know that feeling, don't you? I really wasn't up for anything, other than wasting the day, and this I did in style! Before I knew it, it was 3.15 and the museum, which I had so wished to revisit, had closed its doors, to the likes of me. Curses! Arriving back at the 'Orestes' rooms, I found that my clothes had been washed, and were waiting to be hung out to dry. "Gauld bless ya Kyria!". The air was damp, and the washing-line was carefully hidden behind the shade of a lemon tree, which in turn was hidden in the shade of a courtyard; itself , naturally, being of the shady kind. The clothes would take an age to dry, but an age, I had. Hadn't I? The day went from bad to worse. My cure for having slept too much was to go to a bar for a couple of beers, at the wonderful kafeneion Agora opposite the square, and, as a result, I took a late siesta. When I awoke, for the third time that day, I found myself in a "grumpy-pooh-pooh-head", kind of mood. Checking the state of dryness - or lack thereof - of my clothes, I discovered, that they were wetter than when I had removed them from the washing machine. I would just have to pack tomorrow morning. The remains of the day, are a complete mystery to me. I can't even remember where I ate this evening. I know that I did eat, but have no idea where. I also know that I drank too much, and felt an overwhelming need for a Rex - or anybody else - by my side. A loner who becomes lonely. How useless can one person be? either a colony, or heavily influenced by the "Minoans" A tholos tomb? Found spread around Archanes. Anemospilia: Anemospilia (windy caves), is one of the Aegean's most important archaeological sites, though it wasn't until the late 1970's that this came to light. The subsequent excavation, affected the island's whole Bronze-Age history, or at least people's perception of it. This is a "spirit of place" site. There's not a great deal to see, but if you know a thing or two about the site's grizzly background, I defy you to keep the hair on the back of your neck, from doing a jig! In 1979, the team of, John (Yannis) and Efi Sakellarakis, discovered a collapsed building, within which, lay evidence of the previously unthinkable. The "'Minoans" (or more accurately, the people of Bronze Age Crete), had always been thought of as a peaceful people, but within this collapsed protopalatial (c.17th century BC) building, lay unequivocal evidence of a human sacrifice. Tied to an alter, lay the skeleton of a man, whose throat had been cut, much the way a bull would have been sacrificed (the knife, which was found upon his skeleton, currently resides in the museum in Archanes town, and has a rather strange, hybrid, boar-like animal on its blade). Three other skeletons lay in or around the scene - a re-creation of which can be found here. Within the "west room", were a "priest", a "priestess" and, in the antechamber, as if attempting to escape, lay the remains of a fourth body. This fourth person, had been carrying a vase, similar to those depicted on sarcophagi, ordinarily used to collect blood from bull sacrifices. If the executors had believed that this sacrifice would appease the Gods, they were very much mistaken. An earthquake - presumably the reason for the sacrifice in the first place - caused the building to collapse, trapping the killers in the very building used for their act. This discovery caused outrage and enormous controversy in archaeological circles. Surely the "Minoans" didn't do such things! Well, it would appear that they did! A later find at Knossos, seems to prove that child-sacrifice - and perhaps even cannibalism - was also practised, though - we hope - rarely! One of the interesting finds, was that of a silver and iron ring, upon the skeletal fingers of the "priest" (who stood 5 foot, 10 inches tall 1.78 metres, so must have been a giant of a man, in those days, when the average height of a "Minoan" male, was 1.67 metres or a little under 5'6" ). Iron was a very valuable commodity indeed, back in those days; in fact this is the earliest example of it being found in the Aegean; it's also - according to J Lesley Fitton, in her book 'Minoans', the only Mycenaean or Minoan ring found in position on the owner's finger. The building itself, is unique in Crete. A couple of clay feet of the "xoanon" (pic), are all that remains, of what once must have been a slightly larger-than-life-size statue. According to the Sakellarakis', ('Archanes: Minoan Crete in a New Light') the feet would have worn shoes at one stage! It would seem certain that the rest of the body was wooden, and consequently destroyed by the fires that ravished the building - shortly after the earthquake - due to the use of oil lamps. It was never rebuilt. Fourni (Phourni): This is by far the largest Bronze-Age cemetery on Crete. 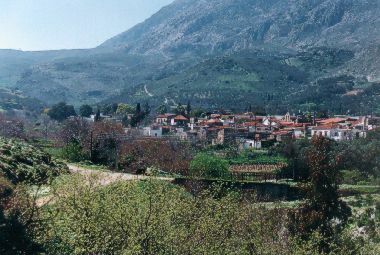 "Mycenaean" grave circles and funerary buildings co-exist at Fourni, which lies just north of the town of Ano Archanes. The sheer time-span that this grave complex encompasses, is staggering, covering, as it does, at least 1,300 years of burials. The burial practice in those days, was to encase the body in a either a pithos (large vase) or a sarcophagus, and plenty have been found. There are no fewer than five "tholos" (roofed or vaulted) tombs, dubbed "bee-hive" by Arthur Evans. One of these tombs, known as "Archanes Tholos tomb A" (pic), had been known for years, and was even used as a hiding place during W.W.II. According to J&E Sakellarakis, the tomb was known as the "hut", by locals, and was clearly visible for all to see. Little did they know, that this "hut" was close 3,500 years old (it dates to the beginning of the 14th century BC), and had been used as a burial place for the dignitaries of Archanes. Whilst there are other examples of Tholoi in Crete (such as the ones at Kamelari, Apesokari, Koumasa and Platanos), this is the tallest of them all, at 5.04 metres (16'6"); it's 4.31 metres (14'1") in diameter. The most interesting find, as far as bodies are concerned, was that of a woman - judging from the jewellery - buried alongside a horse, which had been slaughtered for the privilege. Iraklion and Archanes museums share the artefacts from this site. The "Megaron" at Vathypetro, has been called a "little palace", due to a defunct belief that this was an "out of town" residence, for whoever resided in Archanes (seeing as the "summer palace" at Archanes was believed to have been an out of town residence for whoever lived at Knossos, it all becomes rather diluted!). The site lies a few KMs south-west of Archanes Both a wine press - suggesting that the vineyards of this area are the oldest source of wine in the world - and an oil press, have been found here, so it was a major development in its time. This was one of Spiros Marinatos' excavations during the 1950s. Not one of his best efforts, though it was continued by John (Yannis) Sakellarakis in 1979. This is a major site; it is close enough to other "more important" places, for you to be on your own, if you fancy a visit, but as the 'Rough Guide to Crete' says, get there early, or you'll be forced to look at the artefacts through a barred window! Sunday the 25th of May. So, did I visit any of these sites, yesterday? No, of course not! I'd other things to do, such as sleeping and drinking and sleeping again. If I had fallen off the wagon yesterday, I was about to clamber back on-board; its wheels would be seriously unhinged, but I knew little of what lay ahead for me, today. If I had, I would not have moved a sinew! The sun was shining, the birds were singing. I too, was in a chirpy frame of mind...and my clothes...well my clothes...were still soaking wet! I recalled how Christopher Thorne (in his book, 'Between the Seas') had tied his newly-washed clothes, to the back of his rucksack, enabling the sun to dry them. Thing was, he had washed his shirts practically every night, and hadn't been lumbered with the erstwhile contents of three quarters of a large rucksack of wet clothes. My jeans were the main problem. In their state of "dampicitiness" (thanks to George W.Bush for that one! ), they weighed the proverbial "ton", and even I am too proud to have been seen with these dangling off the back of my bag. No, I would wait until I was out of town, before attempting that trick. At least it was a sunny day and, hopefully, the clothes would dry, whilst I walked. I still had one clean t-shirt, but decided against wearing this, instead making a note of placing it in a plastic bag at the top of my rucksack. And about my person? The one I'd had on yesterday evening, of course! Pay attention now; I'm a slob! I discovered that I'd probably eaten pizza last night, as the evidence upon the shirt, was clear for all to see. I wasn't here for a fashion contest, however, and wore it anyway, along with a fetching pair of tracksuit bottoms which, once, might almost have been almost clean! I met up with my landlady, and paid her for the room, adding a tip for her part in the "dampicitinicy" of my clothes. She smiled at me and asked whether everything had been OK. It had been. It really had! It wasn't Archanes' fault that I had ruined my "dopey" day, or indeed that of my hostess, that the weather had conspired against me in the change-of-clothes stakes. I would definitely recommend both the town of Archanes and the 'Orestes' rooms, as places to visit and stay. So, off I headed. The one thing I had done, yesterday, was to find out where the trail, out of Archanes, continued. A somewhat dim-and-distant memory this, but it was pretty easy to re-find. My map had the E4 trail running north of the town, in a south-westerly direction. The direction was correct; its whereabouts were not! On the south-western side of Archanes - where I had left it yesterday! - a rather pretty trail skirts the southern side of Mount Juktas, and half an hour after setting off, there I was, on the mountain's other side. My first spotting of an E4 sign followed soon after, as I headed north. Another sign suggested that I should head west, but I ignored this, as I preferred yet another sign, painted onto the side of the mountain, which convinced me to continue walking North. This made sense, as according to my map(! ), I needed to pass through a village, before heading west to the village of Pouka (O, how my map and my skills in reading it, were going to have fun with me today!). Reaching the village (more of a hamlet really and seemingly unnamed), I asked whether I was on the correct trail. I received some strange looks when mentioning the village I was aiming for. Whenever I mentioned Pouka, the villagers preferred to talk of a church called Profitis Ilias, which looking at my map, was close to where I was headed. Maybe it was their pet name for the area; maybe I looked as though a visit to a church would help me. Either way, I allowed them to have their religious foibles - it was after all, Sunday - and followed a handful, or two, of pointed fingers, in the general direction we all preferred. This is rather pleasant terrain, due mainly to the lack of driveable roads, rather than stunning scenery. I was alone, which is how I like it; the desperate feeling of abandonment that had temporarily haunted me yesterday had now nigh-on evaporated, which was more than can be said of the wet t-shirt competition, taking place within my bag! I reckoned that the most important item of apparel to get dry, were my jeans, which I took out of my rucksack, and rather awkwardly tied to the outside of the bag. The track I was on, took me past a couple of churches, as it winded its way upwards to the village of Pouka. At this point I saw a sign. 'Profitis Ilias' Hang about! Aha! All became clear. Pouka was a church, and Profitis Ilias was the village. I had managed to read my E4 map incorrectly. There I had been, wondering why villagers had been directing me to a church, when all along, this is what I had been asking them directions to! The beautiful morning I described, had reinvented itself, and now in its last throws, was of the cloudy variety, with more than a hint of drizzle in the air. It's a nice village, Profitis Ilias, but coming from the direction I did, that was not my first impression of the place. A rather ugly rubbish deposit - with a decomposing lorry which, presumably, had veered to near to its edge - is what greets you, from the south east. Rusty beginnings! Once you're past this, however, everything improves exponentially. I arrived at Profitis Ilias' kafeneion just as the heavens opened! I ordered a coffee and a lemonita, had a chinwag with the proprietor, and watched helplessly as it chucked it down. I returned my jeans to my rucksack, in a somewhat wetter state than when I had taken them out, half an hour ago. One thing was missing. A plastic bag with the only dry article of clothing I possessed. A t-shirt. Somehow I had managed to drop this on route. Why had I left my waterproof jacket in the car, when Rex deserted me? Because, not for one moment, did I believe that I'd encounter a short shower, never mind the past three days of nigh-on perpetual precipitation that had fallen upon me from a great height! I sat there, helplessly, for half an hour or so; imbibing two Greek coffees and a couple of lemonitas, before deciding that I really needed to be getting on. As luck would have it, my timing coincided with the cessation of the worst of what Crete's weather had offered me to date. It was now merely drizzling again, as I placed one size-nine boot in front of another, but the skies were dark, with the promise of some wet times ahead. An old castle (Kanli Kastelli) on the west side of the village would have been visited at greater length, if I hadn't been in a desperate hurry to be on my way. I liked this village; the people were friendly, but the sooner I launched myself into action, the sooner I'd be in Ano Asites. According to one of my maps(!) the road I now found myself on, would have taken me in my desired direction (according to another map, the road didn't exist! ), but as chance would have it, an E4 pole, as if by magic - or, perhaps, conspiracy - appeared to my right (north). I was back on dirt roads, and spraying mud in every direction as my boots thundered repeatedly against the track's surface. My tracksuit bottoms were now soaked through and caked with bits of Crete which, frankly, I would have preferred to have remained part of this 'great island', rather than attached to me!. After a fair deal of winding and a couple of incorrectly chosen paths, I came across a series of E4 poles. My heart cheered (it doesn't take much!). It had stopped drizzling. Hey, I might even enjoy this day. Another pole ushered me in the correct direction (west) and I followed it, straight to a raging river! Now, this couldn't be right. Could it? There was no way I could cross this. OK, it was no deeper than a half a metre, but surely the E4 should circumvent this, or provide a foot bridge! "Christ!". I retraced my steps to where I had seen the last sign, and was left in little doubt that I had taken the correct path. Ignoring my ignorance, and leaving my rucksack by the obvious route, I tried three or four different paths, all of which ended at the same river, only at wider points of its meandering way. Retrieving my bag, I sat down and mused for a while. My two choices were to head back to the village (Profitis Ilias, Pouka, call it what you will) from whence I had spent the past hour attempting to distance myself, or cross this river. I would cross this river. By hook or by crook, I would cross this river. By Georgios I would! Taking off my boots and socks, placing the latter in my rucksack and tying the laces of the former around my neck, I rolled-up my tracksuit bottoms as high as they would go, and prepared to cross the river's five metre girth. On the other side of the river, the trail would recommence, and before I knew it, I'd be Ano-Asites-bound again. Wouldn't I? Don't ask me! As soon as I placed one naked foot in the river, my mobility became somewhat restricted; firstly by the river, and then by that sinking feeling. Not easily put off, I threw another foot in front of the one previously mentioned. Not one of my best ideas. I may have many tricks up my sleeves, but I can assure you, walking on water is not one of them! All of a sudden, I was up to my knees in silt(!) and I'd only traversed a quarter of the river's girth. The bottom of my rucksack was in danger of becoming immersed, but my real worry, was I now felt incapable of moving, in any direction! I was in a river, whose bed was made of quicksand! Oh, by the way, did I tell you? It was just after I'd been taking off my boots and socks, that it had started to rain again! Right in my face! There I was, statuesque, feeling drier from knees down than up. Somehow, I back-tracked to the edge of the river bed and stood there feeling foolish and a little depressed. Nope! Completely depressed. Thoroughly miserable! I took my towel out of my rucksack and tried to dry myself off a little; the towel was wet. I was wet! If this felt like a wet weekend in the Herakleion nomos, that's precisely what it was. So, back I went. Back to the village that I had wanted to return to. One day! But not this day! I was not a happy bunny, as I once again found myself at the westerly-most fringes of Profitis Ilias. For the first time since this entire walk had begun, I felt like abandoning the whole thing; and I mean that most sincerely! Problem was, that if I were to do that, I would either need to get to Ano Asites or walk back to Archanes. I doubted if I were on any kind of bus-route, and the chances of my finding a cab, were more remote than the landscape where I now stood. Biting the bullet, off I set, to see what thrills, spills and other wet places, were waiting for me. Very little happened in the next couple of hours. At one point, the road forked. I needed to pass through the village of Kiparissos and I asked a passing shepherd - enjoying the rain and a wander - which road I should take. Either, was his answer, and upon closer inspection, I discovered that he was correct. The right fork was the old road, and the left, the new. I preferred the old road. He too had a soft-spot for it, and stated that it was the quicker of the two options, should I be walking which -damn it! - I was. Just as I was about to descend, I received a visit from the police...as one does! A rather smart, four-wheel vehicle, suddenly appeared behind me, and drew-up alongside. "Yiasas", I offered. "Pou pas;" (Where are you going), I was asked by one of the two rather large police-officers who inhabited the car. "Stous Ano Asites", I replied, gesticulating in the general direction of where I believed the village to be. "Yiati;" (why?) , asked the second policeman. What a bloody good question! I had no answer, other than it was marginally more preferable than standing here, in the rain, talking to them (I didn't say this of course; I was sorely tempted, but instead I scratched my head, and thought for a while. What could they do? Arrest me? I recall imagining the inside of a Greek police cell. Not somewhere I would ordinarily like to spend any amount of time, but in my imagination, the overriding factor of that cell, was one of relative dryness. Perhaps I'd also get a change of clothes. Prison issue; I'd certainly look better dressed than I did right here, right now). Instead, I told them that I was walking the island. Two pairs of raised eyebrows later, and the inquisition continued. I was asked from where I had come. "Simera, apo tous Archanes" (today, from Archanes) I informed them. Wrong answer! "Ochi, apo pou eisai;" (No, where are you from? ), had been the question. "Apo tin Anglia" (from England) I informed them. "Youw speeek Inkglesh", asked the first policeman. "Like a native", I replied. For the first time, something approximating a smile lit up the policemen's faces. They should try this more often; it became them. Within a couple of seconds they were gone, without offering me a lift, which I would most certainly have taken up them up on! This all happened in no longer than a minute. What's Going on 'ere then? The shepherd was still there -or thereabouts - and now two schoolboys joined him, as I started my descent via the road less travelled. "Pou pate;" (Where are you going?). called Georgios and Georgios (probably! ), from the road above me. What was going on? Why this sudden interest in my movements? Rather than tell them my ultimate destination, I indicated the village which I could now clearly see below me. I was told that I was going about this in entirely the wrong way, and that I should be taking the road that they were currently standing on. The shepherd and the boys then proceeded to enter into a furious debate regarding the better of the two roads to take. I waved my goodbyes and accelerated to out-of-earshot distance. Had this been a glorious day, and had I not been wet-through, and had I not been at least two hours behind schedule, and had I not been wishing that I had poked at least one policeman in the eye with a sharp bastouni, and had I not been feeling the ever-encroaching affects of the afternoon after the night before, and had I not been caked from head to toe in mud, limestone and river-bed, and had I had just one item of clothing that could be described as anything other than "soaking", and had I thought for one moment, that at the end of the day, I would end up in a room somewhere, with a comfy bed, a tumble drier and a power-shower, I would probably have found all this, highly amusing, but I was having a serious sense-of-humour failure. No idea why! This was compounded upon reaching the lower part of the village I'd been aiming for. It was the "lower part" segment of that last sentence, which was my main problem. After what had seemed like an age, I came to a flight of stairs, which, my weary legs and wearier mind, somehow carried me up. After a couple of minutes or so of climbing, I realised that the 'Georgios'' had been quite right about which road I should have taken into the village. All I had done was lower myself into its nether regions and was now climbing back up to the very road that I should have taken, in the first place. This detour probably added no longer than 10 minutes on to my journey, but I was worn out by the climb. It was now drizzling, rather than raining, but all in all it was proving to be quite a miserable day. Not for the good people of Kiparissos. Oh no! This lot would, seemingly, enjoy life, regardless. I passed two parties of 10 or so people, standing outside, celebrating a birthday, or the martyrdom of some saint or other, or the drizzle; who knows? Oblivious to the weather, these people were getting merrily rat-faced. As I passed, I wanted to join them. I wanted to forget; I wanted to sleep. I did none of these things. Instead, I allowed the local dogs to bark their annoyance at my presence in their village, before heading west again and squelching-off towards Venerato, which was close enough to my ultimate destination, to allow me to want to be there as quickly as possible. To get to Venerato, two more villages needed to be passed through, both of which I really liked the look of. Not that there was a great deal going on in either, and both had that "seen better days" look, but the villages of Pyrgos and Sinapi (the latter with a population - according to the 1991 census - of nine!) both had an element of "je ne sais quoi"; a kind of remoteness; a spirit of place, disturbed only by the extremely occasional passing of a car, and even in the grim condition I found myself in, these were places that I would like to revisit. One day. One dry day. One dry day...in a car. Just after the village of Sinapi, the road swings from a westerly direction to a north westerly one, and this is where it becomes, all up-hill. The distance between Sinapi and Venerato is 8Kms, and I had already trod at least two of these Kms. I took the opportunity at this point, to sit down beside a river, and take in a bit of scenery. All in all, it was rather pleasant, in a wet kind of way. In past trips to Crete, I had always been surprised when I discover a river that isn't dry, at this time of year. Not this time. The river was gently meandering along and, given the weather of the past 48 hours, my only surprise was that it wasn't about to break its banks! I sat there for about 20 minutes, attempting to make my interior as wet as my exterior, by sipping from my flask, but my heart wasn't in it. I creaked back into action, determined to reach Venerato in 45 minutes. That gave me a target, and the loneliness of the long distance - and soaking wet - walker, became more bearable as I pushed my body to its extremes. The road up to Venerato, was pretty splendid, as it happens. As I ascended the couple of hundred metres altitude from the river to the village, I looked back on the panoramic vista that presented itself. On reaching the village, I discovered that, here too, was a place that I liked. A sizeable place with a population of around 1,000, and a Venetian heritage. A kafeneion was found, and I sat down to a Greek coffee and a rather welcome tsikoudhia. I was tempted to ask whether or not there might be accommodation here. Why head for Ano Asites without knowing if I could find a place to stay, if there was somewhere here? I decided against that course of action, however; if I were to do this, tomorrow's walk through the Ida range, would be all the longer. It was 5PM and I reckoned on another hour or so to Ano Asites. That would be early enough to allow me to find a field, should I not be able to find a place with a roof. Rumour had it, that there was a mountain hut close to Ano Asites. Maybe I would find another lady similar to Kyria Stella, at Selakano; thrusting keys in my general direction and offering me food. I reluctantly left Venerato, and headed west, once more, towards my chosen place of rest. One village later - the charming one of Kerassia - and having walked through a beautiful landscape, there I was. Arriving in Ano Asites (population 423; elevation 480 metres) itself, I soon realised that the chances of finding accommodation here, were slim (there was at least one "tourist shop", but the place had that "drive-through-stop-a-while-and-leave" look). I entered the second of the kafeneia that I saw, desperately hoping that I would immediately be offered a bed for the night. That desperate look must have showed. It was 6.45 PM, as I entered the kafeneion. It was packed, but I managed to find myself a seat at a table all of my own, and with my back turned to the rest of its patrons, I waited to be served. Much the same as my first walk, the talk was mostly about albinos! OK, a joke is a joke. I knew what they were saying. The suggestion was a verbal one in much the same way that it had been on my first walk down to Rodakino; in a way that my meeting with the policemen earlier that day had been implied. That scruffy, mud-covered one on the table over there, must be an Albanian, and thus was here to: steal their goats, jobs, daughters, sons, or murder their wives (delete/add as applicable) whilst they slept. I have no objection to being called Albanian; the ones I had met thus far on my walk, had all been thoroughly nice people. No, what I objected to - other than the racism - was being tarred-and-feathered, before I had had a chance to say a word. "Alvanos...Alvanos...Alvanos", muttered my fellow drinkers. Well, they would have been my fellow drinkers if I'd had a drink! Every time I turned round (which was twice), eye-contact was avoided. 15 minutes had passed and the young boy running the bar, had managed to totally ignore me, and you just couldn't get served without him! Mustering the courage, I squelched my way to the bar. Mustering up my best Greek, I order a beer and a lemonita. My best Greek, at best, is awful. "Spazmena Ellinika", came a mutter from somewhere to my left. "Spazmena Ellinika" means "broken Greek", and is really a euphemism to describe those from Albania! I ignored the comment and making sure I kept at least one beady eye on the boy whom I hoped would be serve me, I repeated my request, and made a big show of getting my wallet out, for the assembled. The bill came to three euro, and sifting through my wallet, I quite deliberately took out four 50 Euro notes, before finding a fiver and telling the boy to keep the change. Who had this Albanian murdered to acquire such wealth? I returned to my table and waited for the boy to bring my drinks. Just as I did so, my mobile rang. O, how I needed that. It was my brother-in-law, Ian. The signal wasn't great, but never before had I been happier to hear from anyone. I spoke as clearly and as loudly as I could, using expressions that would prove me to have a command of English and not of Albanian. I am quite ashamed of this. Let them think what they wish, but at the time, I just wanted to be accepted as the Scottish-Cypriot, Romford born, East Barnetian that I am. The place became hushed, as the locals hung on to every word I said, even if they couldn't understand most of them. "Yes...yes...yes...", I enunciated before launching into a tirade about the village and the people of Ano Asites. If anybody other than me, had spoken English, they would have been left in little doubt that I didn't like their village or its inhabitants. I was wet and cold; I had nowhere to stay, and whilst I had my sleeping-bag and it wasn't raining(! ), the thought of spending the night outside, was not a nice one. My beer and lemonita arrived, just as I finished my conversation with Ian. For the five euro I had paid, I received a large plate of mezedhes as well, consisting of a large slice of ham, with tomatoes, onions and olives sitting on top. I wouldn't usually have touched anything that had shared a plate with this remnant of ex-pig, but these were no ordinary circumstances; in fact I came quite close to wolfing down the ham too, such was my hunger. I thanked the boy, and took the opportunity to ask whether or not there just might be somewhere to stay in his village. Not a hope of it! Oh well. As I took my leave of the charming company, I'd shared the past hour and a half with, I discovered one of the reasons for the villagers' down-at-mouth look. Firstly, I noticed a black arm-band on one of the men, and idly gazing back upon the throng, discovered they all had one of these items of apparel on; as did the people on the streets! Someone, very close to these villagers' had died very recently, and I suddenly felt awful. Firstly, I had gate-crashed on people's grief, and secondly, here I was, with the singular problem of where to lay my head this evening, whilst these people had proper reasons to look a bit miffed! I headed out of the village itself, and could make out the mountain range that I intended to cross over the next two days. In the bleak light of dusk, I could plainly see that it was was covered in cloud from around 600 metres up. There was absolutely no way that I would walk the range, unless the weather cleared by tomorrow morning, That would just be suicidal. There was little I could do about it now. I would just have to wait until morning. If it were clear, I would head onwards and upwards. If not, I would walk around the mountains, via the road. This was my big decision, and having made it, I attempted to get some sleep. The ground was wet, and uncomfortable, and I was glad that I had brought a small roll-up mattress with me. Immersing myself in a silk protective cover (named "Mummy! ), I wrapped myself in the sleeping bag, and reflected upon the past two days. I had not enjoyed these one little bit, but I felt that this had mostly been my own fault. During the past winter, I had walked across the flat plains of Hertfordshire, more times than I cared to remember. On at least half of these occasions it had been raining; sometimes torrentially. The difference between then and now, had been the promise of a piping hot bath at the end of the day and a feast fit for king. Here and now, I was cold, hungry and scared of the days to come. It was no longer raining, but dampness permeated the air and, as the mosquitoes announced their arrival, I lay back and thought of England. I eventually drifted-off, reminiscing of my little flat in East Barnet; tapping on my computer and day-dreaming of the place in my heart...day-dreaming of Crete!